Russia has an effective antibacterial system that helps avoid uncontrollable outbreaks of viruses similar to Ebola, says one of the country’s leading epidemiologists. Research by a Boston university also indicates that the chances of the Ebola virus spreading to Russia are currently minimal. According to a study published by the Mobs Laboratory at Boston's Northeastern University on Oct. 6, the Ebola virus has a 1 percent chance of appearing in Russia in October. In comparison, there is a 75-percent chance of the epidemic appearing in France. The Mobs Laboratory has based its prognosis on several factors, including daily airline passenger traffic and the community, hospital and burial transmission dynamic. Mikhail Shchelkanov, an Ebola expert and director of the Virus Ecology Laboratory at the Ivanovsky Virology Institute in Moscow, believes that "it is impossible to map the spread of the virus in such a manner." Shchelkanov was a member of the first group of epidemiologists that was sent to Guinea in August this year to assist the local health system. He told RBTH that, "there exists a nonzero possibility of the virus spreading to developed countries in Europe, including Russia." Earlier, Anna Popova, Head of Rospotrebnadzor, the state consumer and health organ, said that this year there were only 16 cases in which the Ebola virus was suspected of being brought to Russia from West Africa, and none of them were confirmed. Popova added that doctors in Russia are monitoring 118 people who have returned from West Africa, while 424 people have already passed the medical exams. According to the World Health Organization's latest data, as of Oct. 9, 8,034 people are infected with the Ebola virus in West Africa, and 3,866 have died. The press office of Moscow’s Sheremetevo International Airport told RBTH that as of October 10, "no one has been infected with the virus." 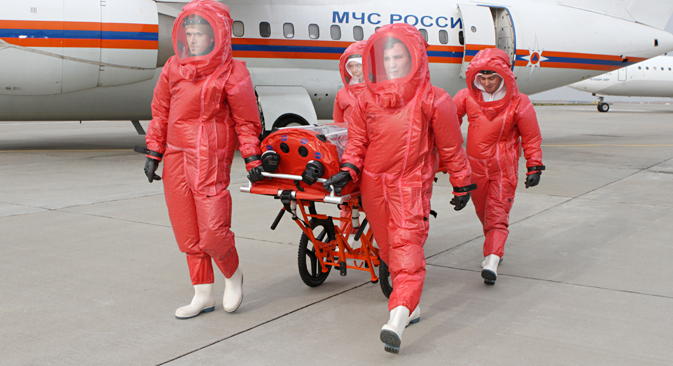 As in all airports servicing international flights, Sheremetevo also has Rospotrebnadzor personnel working on the premises and in the event of an emergency Sheremetevo "can provide space for isolating the sick." "Even if there is one case of the Ebola virus entering Russia, as has happened in the U.S. and in Spain, the sanitary epidemiological service, which has a considerable amount of experience fighting infectious diseases, will help remove the possibility of it spreading," said Health Ministry Press Secretary Oleg Salagai on Oct. 9. “Chief physicians at all hospitals have been informed of the measures to fight Ebola," says Shchelkanov. "All hospital doctors, including ordinary pediatricians, are also aware of these measures." However, even the most authoritative statements made by government officials are unlikely to eliminate doubts among Russian citizens. "It must be noted that when an infected patient without clinical symptoms enters the country, he himself does not know that he is infected and in this period sensors are incapable of detecting the virus in his organism," says Shchelkanov. On Oct. 9 the Russian Ministry of Education and Science recommended that universities postpone the academic year for students from Africa due to the Ebola virus. Shchelkanov says that this decision was made because the people in quarantine are mainly "students from West African countries who still have not passed the 21-day quarantine." According to the Center of Sociological Research, in 2012 in Russian universities there were 21 students from Sierra Leone, 228 from Guinea and almost 1,300 from Nigeria – the first two countries are at the epicentre of the epidemic. A specialized anti-epidemic team, which includes specialists from Rospotrebnadzor’s scientific research institutes, has been working in Guinea since August 22, 2014. For diagnosing the Ebola virus the team uses Russian test systems whose effectiveness has been confirmed by the World Health Organization. Head of Rospotrebnadzor Anna Popova says that the organ is preparing an additional team of epidemiologists to be sent to West Africa. In September this year Deputy Prime Minister Olga Golodets said that Russian doctors are systematically testing a Russian vaccine against the virus in the zone affected with Ebola.